In 1950’s England something horrible has taken to the streets reeking death on mankind. You are a part of the force that has been tasked with saving humanity! The action takes place in England and you are (unsurprisingly) an American soldier by the name of Nathan Cole, sent to save England (and the world) from the evil Chimera aliens. Funny how it’s an American soldier that has to save the world when there’s no hope left, makes you feel all warm and squishy while dreaming of Mom’s apple pie as the good old boys of the U S of A come charging in at the end to claim another victory. I wonder why a good old British Tommy was unable to save his home land, after all we’ve managed ok up until now…. but still, stereotypical ‘Rambo’ fever aside that’s the basic plot. The graphics portray a very nice subdued townscape as you battle through the houses and take down any alien invaders as you go. Utilising a fairly standard control layout you are armed with a concoction of weaponry, some of which has been stolen from the Chimera and modified for you to use! This means you can have lots of Quake style fun with a plethora of guns throughout the game and adds an interesting twist to the Call of Duty style game play. The graphical environment is very nicely modelled, in places it has an almost cartoon/cel shaded edge look and although the level of detail and textures don’t make it up to the level of Gears of War it is still a very good launch window game for the Playstation 3. The environment is filled with destructible elements, shop signs can be shot down, windows gunned out and even the town hall clock can have it’s hands shot off but rarely do you get much time for this as the Chimera advance on your position. Weapons can be picked up along the way and I found it amusing that you can actually pick up every weapon! No limited carrying capacity here, just grab and shoot! Couple this with the hordes of spider like creatures that attack on occasion and it goes some way to putting the game more in an arcade style mode than ultra-realism. 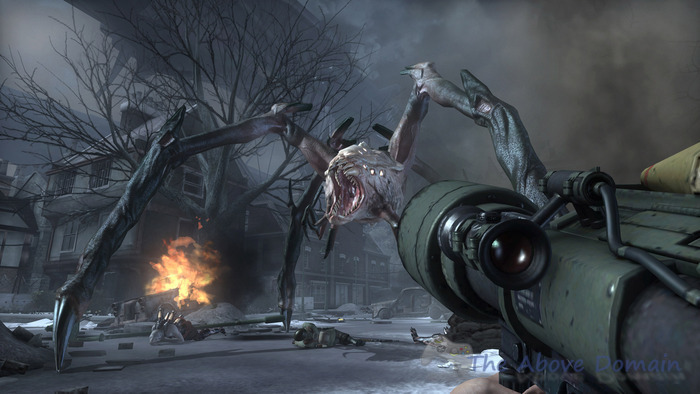 Like the present Call of Duty 3 there are some ‘battle action’ moments during which a Chimera will grab you and go for the kill, at this time you can shake the controller wildly from side to side to free yourself and deliver a killer blow. This is a minor diversion from the campaign but one which is quite engaging nonetheless. Alongside the usual driving sections and gun-play the game pans out pretty much as you would expect but the difficulty does start to ramp up as waves of creatures begin to descend upon you through the middle section of the game. I haven’t progressed much farther as yet but the promise of weather filled levels (rain and snow) indicates there will be some variation in scenery as you advance. Now I’d actually be willing to play some more Resistance except the controls have been very shoddily mapped and are far from easy to get to grips with after 12 months of Call of Duty. The fire button for your weapon is not actually the right trigger no that would be too obvious; it is instead the awkward little right bumper button. When you want to aim down your iron sights you can’t just pull your left trigger then release it to drop back to a normal view. In Resistance you must click down the right stick which toggles the sight view and then click again to revert to normal. Small things – yes, but it makes the game play a chore at times. My other annoyance is the need to press a face button to throw any grenade, this necessitates lining up your lob first with the right-stick camera before you then have to press the button with your thumb in the process releasing the analogue stick and relinquishing directional/aiming control for a split-second. All these foibles are minor and mainly brought about by my familiarity with the 360 controller which seems so much more comfortable and engaging in a fire fight. These annoying niggles will be explored further next time as I compare the two consoles controllers in use. Overall though Resistance is an accomplished game, fast-paced and entertaining but leaning more towards the Quake style of play at times than a measured Call of Duty approach. It cannot match up to Gears for absolute graphical finery but does provide a solid launch shooter for the Playstation 3 to build upon which is fun to play and offers a different spin on the usual WW2 shooter. If I could hook up my 360 controller and play with that and some sensible button mapping then I’m sure I’d spend a few more hours playing through the game! Online play consists of the usual style games and you can select between a room of up to 16 players or 16-40 players. Try as I might I eventually got bored waiting to join a bigger lobby and only managed to connect to the 16 player rooms. Here the action was fast paced and even more akin to Quake with giant fans in the floor you can run over to get a boost up to rooftop level. Weaponry spawns across the map and everyone runs and guns making it a very fast paced online experience. If you all had PS3’s and this game I’m sure it could be fun but for now I’d rather get my kicks in Gears of War country with a bunch of friends thanks!